increased transparency as buyers can make informed decisions when they evaluate options on performance, cost, and availability. Today, within the construction sector procurement is a slow, labour-intensive and generally cumbersome process. This is because digital marketplaces are just coming into existence. The emergence of such digital marketplaces creates a huge opportunity for the industry to improve its productivity and profitability if given the proper guidance in terms of standardisation, interoperability and product identification. So, what can be done to fast track the industry’s journey towards the rise of the digital marketplace? A few years back Hotels.com made a smart move that worked miracles for every regular person trying to book accommodation on the platform. 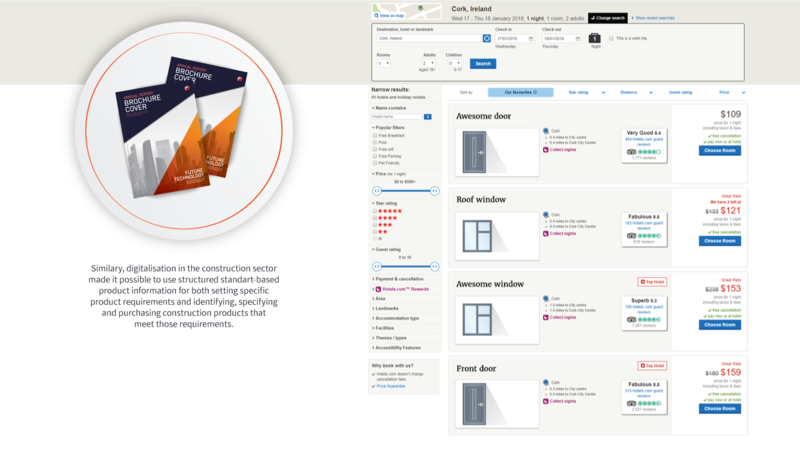 The market leader started creating a product catalogue providing rich information (data) about each hotel based on data provided by its owner. Why? Because in a market saturated with diverse quality housing + additional services the consumer was becoming more and more aware of each product’s characteristics and their importance for their final purchasing decision. Consumers were becoming hungry for data and the hospitality market was fast to capitalise on this. The way they achieved a common platform for all hotel owners to use was by devising a standardised template that was agreed and used across the whole industry. We can do this in construction too – we just need to agree and work together. 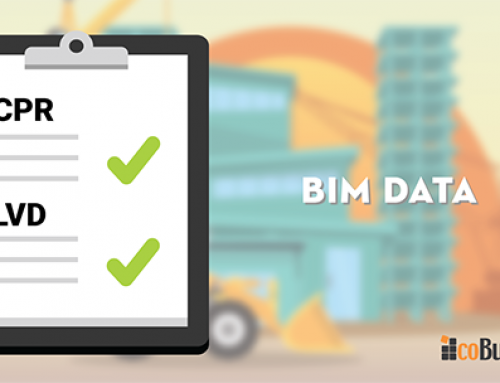 Through a similar logic of devising common data structures and an agreed language that machines can understand, the construction industry can open many doors for the efficient use of data across the whole supply chain. Moreover, the work that is being done towards agreeing on the methodology for data templates will be instrumental in closing the gap between design, manufacturing, and operations. ‘In order to take advantage of a commonly agreed way of digitizing the construction industry we need to use industry standards as a basis. Through the introduction of the coming CEN/ISO standards on development of (1*) properties and (2*) Data Templates for objects and the identification standards of the GS1System, manufacturers can link their data to the ‘outside world’. With existing technology, we can already start building marketplaces and new purchasing routes in a way that is consistent and trusted by all. And this is just part of the story. I see data templates and their various uses as the fastest track towards meeting building regulations, delivering cost reductions and ensuring data management practices increase the overall quality of the assets we build.’ – explains Lars Christian Fredenlund, CEO of Cobuilder AS. In order to enable the creation of digital marketplaces within the sector, we must make sure that products can be clearly identified by anyone (or any machine) at any part of the product’s life cycle and at any point in the supply chain. To create trust within this process of identification the one single source of the data is, of course, the manufacturer. Once the link between the manufacturer and his chosen identification system is established, the identifier must persist in time, making the solution to identification issues fit for the long years of operation that are characteristic of the construction sector. GS1 Identification Keys enable companies and organisations to assign globally unique identifiers to their products, assets, documents, locations, logistic units, returnable containers, etc. It is common knowledge that the Global Trade Item Number (GTIN) can be used by a company to uniquely identify goods wherever they are encountered. In addition, the GS1 Company Prefix provides access to all the applications, who use the identification standards of the GS1 System (for example to identify trade units and services, logistic units, assets and others). In addition, the Global Individual Asset Identifier (GIAI) is one of the two GS1 Keys for asset identification. Companies can apply a GIAI on any asset to uniquely identify and manage that asset. This could be a computer, desk, vehicle, piece of transport equipment, or spare part, to name a few. Finally, the Global Location Number (GLN) can be used by companies to identify а company’s physical locations, for example a store, a warehouse, or a berth in a port. This allows identification to the level of an instance of a product, because product characteristics may vary in accordance to the factories they are manufactured in. (3*) Uniting this level of unique identification with the structured product characteristics derived from data templates placed within a common dictionary framework provides the needed level of information richness necessary to sustain the ‘golden thread’ about construction products flowing through the stages of construction. In this article we have discussed that in order to create and sustain digital marketplaces in the construction sector we need to ensure that building actors are aware and can easily step on the two pillars named above as #1 Standardisation and Interoperability and #2 Digital Product Identification. 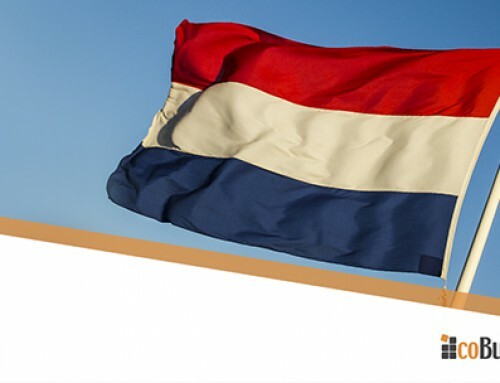 This is how they can fulfil not only the requirements of identification but also the requirements for regulatory compliance and information exchange. The potential collaboration between companies such as GS1 and Cobuilder can prove to be eruptive for the construction industry. This is especially important now that the need for digital marketplaces is growing. With the rising use of prefabricated components that are manufactured off-site and the client-driven urgency to enhance competitive bidding, digital marketplaces may be the key to improving transparency on costs, availability of material and specification based on actual product features. How do you see digital marketplaces developing within the construction sector? 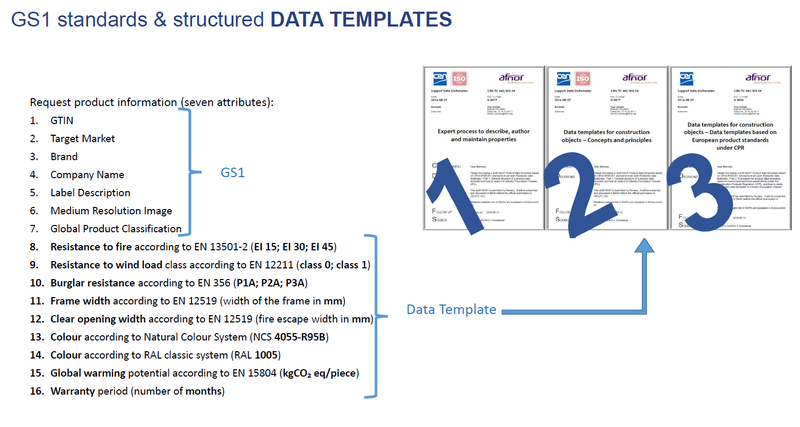 prEN ISO 23387 (WI=00442010): Data templates for construction objects used during the inception, brief, design, production, operation and demolition of facilities. Part 1: Concepts defining the general structure of data templates. 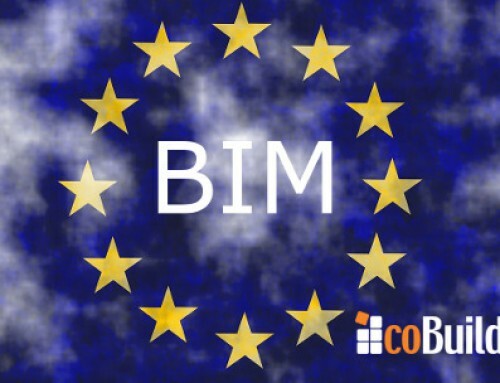 What are the BIM standards in the EU?